A Sincere Request In The Wake Of The Aurora Tragedy. I’m a New Yorker, so this wasn’t the first time I’ve woken up to terrible, tragic, unimaginable news. 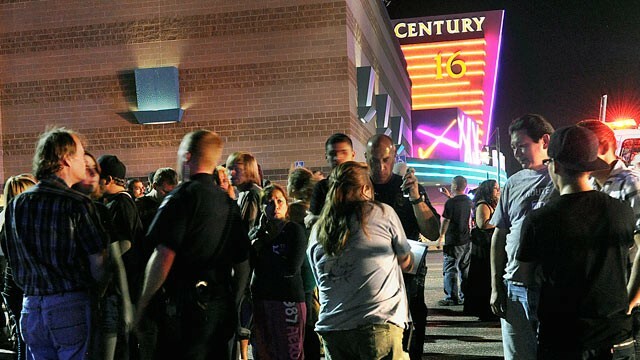 But the story coming out of Aurora, Colorado this morning is particularly upsetting, having the twin effect of being horrible and painful on its own, and for also being a sad echo of a story we all hoped we were done with: the non-terror-related murder-spree on American soil. It happened last year in Arizona. It happened twelve years ago in Colorado. It’s happened before. One time would be too many. There will be countless over-intellectualized think-pieces everywhere you look in the weeks to come, but I wanted to get my thoughts out in front as quickly as possible because mine is a perspective I don’t often see represented anywhere in the mass media. Unfortunately, this type of awful occurrence is too conveniently mischaracterized by those who either knowingly or unwittingly misspeak in their rush to vent their opinions. A preface: This being an election year, it’s probably hopeless to ask that this incident not be politicized – innocent citizens dying at the hands of a gunman invariably bring up the gun control argument, and there are certain factions on a certain side of the political sphere that rant ferociously and unceasingly at the faintest suggestions of reasonable limitations on their lethal weaponry. Likewise, it’s impossible to expect that the film industry in general and The Dark Knight Rises won’t get some smear on them from this situation – it’s not fair, and it’s almost always factually inaccurate, but it’s an easy argument to make, and loud dumb people love easy arguments. But I have two requests of anyone who reads these words, and regardless of your political orientation I would hope that you please consider them. This is about common sense and decency, not partisanship or opportunism. 1) Let’s not make this guy famous. In Dave Cullen’s meticulously-researched and highly-educational book Columbine, the fact becomes clear that the two school shooters in that situation did what they did because they wanted to leave their mark. If you don’t have skills or talent or morality, murder is the most shocking way to make a name for yourself. It’s a subtle victory of the aftermath of the Columbine shooting that that pair of killers aren’t household names. It’s a sad side-effect of many other horrific crimes that some killers and would-be assassins do have a place in the history books. Note that the shooter in Aurora didn’t turn his gun on himself, as so many do. He didn’t kill himself. It’s been reported that he wore a bulletproof vest, in fact. It’s possible then that his motive is similar. Maybe he wants to revel in his actions. Maybe he wants to see all the news reports about himself. What more coldly effective way to achieve immediate notoriety than to shoot up a theater showing a movie that is likely to be one of the biggest box-office successes in recent history? But then: What better way to deny him the notoriety he may crave than to keep his name out of any reporting on the story? Now, I know this isn’t a realistic hope – American news reporting is based on a need-to-know-everything principle that generally does prove to be a valuable approach. But if we must know this criminal’s name, let’s do as little as possible to remember it. Let’s not read any more than we need to. Let’s not watch the inevitable true-crime re-enactments and the (shudder-to-think) jailhouse interviews. Don’t buy that book. Don’t add to the ratings of that TV special. Don’t watch the 24-hour news channels that will throw that name around so many times it can’t help but be made famous. 2) Please do not take this occasion to slander the mentally ill. This plea is of the most absolute importance. It’s common vernacular to dismiss the perpetrators in these shootings as “sick”, “madmen,” “lunatics” or “crazies.” Here in New York City, we have that old generic bugaboo of the unmedicated mental patient who pushes some unsuspecting young commuter in front of an approaching subway train. Now it is true that there are segments of the mentally ill population who are violent. A very small percentage of mentally ill people have histories or (more often) isolated incidents of lashing out. The shooting last night in Aurora was pre-meditated. The shooting in Arizona was pre-meditated. The shooting in Columbine was pre-meditated. These mass shootings are not the acts associated with the behavior of a mentally ill person. They are the acts associated with a cold, calculating criminal bereft of human empathy. Again, he wore a bulletproof vest. There was preparation involved. This wasn’t a spur-of-the-moment attack, not an instinctive outburst of violence. This shooting was an amoral action very much reminiscent of the Columbine incident, in which the two shooters were highly-functioning young people who made a choice that you or I would never consider. But they weren’t “lunatics.” They weren’t “crazy.” Maybe they were sociopaths, but they weren’t mentally ill in the common sense. Take the time to learn the difference. More often, mentally ill people are capable of great empathy; they are even more kind and more thoughtful than those in better mental health. There is a beautiful sensitivity to most mentally ill people I’ve ever met in my life, but of course you wouldn’t know that from media portrayals or right-wing diatribes. You’d only know it from first-hand experience, something that most hasty-to-judge commentators so rarely have. Please don’t lump a merciless killer in with this often-remarkable group of folks. Obviously it’s possible that I’ve jumped to my own conclusions while writing my piece. I’m sure I’ll be made to regret doing it. But I feel like my essential point of view will hold: Rather than using tragedy as an excuse to shout at each other, let’s hold off on the noise for a moment, and listen. Let’s stop and think. I’ve watched it happen the wrong way too many times, and I’m sick of it. Common sense. Our nation was founded upon it. It’s too late to stop what happened last night, and we may or may not be able to do anything to prevent this kind of horrific event from happening again, but we can absolutely handle our reactions to them now, using empathy, understanding, and a willingness to admit that sometimes we just don’t have all the answers. Thanks for this. You are absolutely right and I was thinking the same thing when I saw the news this morning. We have ALL got to learn how to resist the urge to shout our assinine opinions about things we know nothing about. Loe the refernce to Common Sense. See This Movie Right Now: COMPLIANCE (2012).